This post is the final segment in a three-part series about leveraging PoE technology to save money and streamline implementation of industrial networking applications. Figure 3 above shows wireless dead zones can be a thing of the past in a factory or industrial setting with vast open spaces. 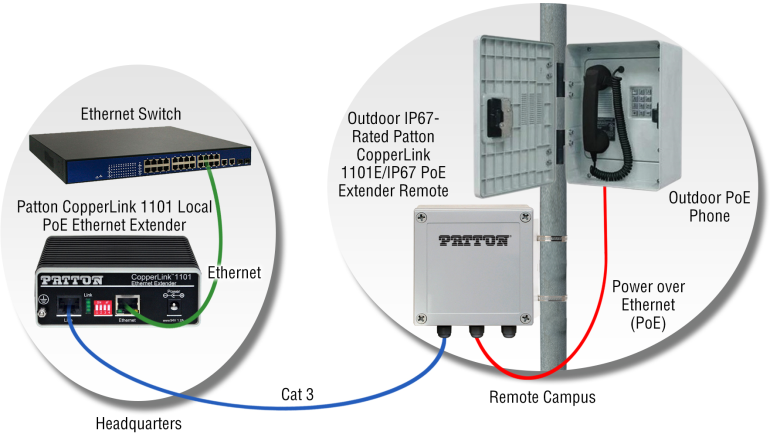 We are able to create or extend wireless connectivity using an existing wired Cat-3 cable connection between the Factory H.Q and a location on the campus using Poe Ethernet extenders. You can now place WiFi access points at strategic locations, eliminating wireless dead zones. With the resulting improved outdoor wireless coverage density, Wi-Fi connections can help industrial tablets and smart phones communicate effectively over WiFi for measurement and control applications. As depicted in Figure 4, no power is required at the remote location, but the SIP PoE enabled IP industrial phone is powered up and communicates with the SIP server located away at the campus factory HQ. Through rain and other extreme conditions an IP67-certified PoE Ethernet extender makes all this possible. Let us now do a quick functional and operational test focusing on extending Ethernet connectivity transparent to higher layer Ethernet protocols and concurrently delivering PoE. 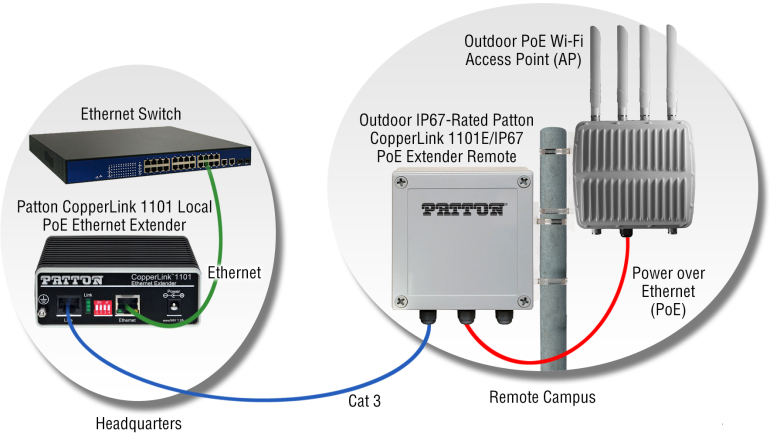 For this discussion and functional testing we will use one such device Patton’s CL1100EIP67-CopperLink Model 1101E/IP67 Outdoor Rated PoE Remote. It is rated for IP67 with the enclosure designed to NEMA 4X. It comes equipped with: 1 xRJ45 line interface that supports 1 to 4 pairs, 1 x RJ45 Auto-Sensing 10/100Base-TX with full or half-duplex operation, 802.3af (mode A) Ethernet port; LED indicator for power/line; supports transparent operation of higher layer industrial Ethernet protocols such as EtherCAT, Modbus-TCP, PROFINET and IP video schemes/compression schemes. Overvoltage protection on Line and Ethernet ports prevents damage from ESD (electrostatic discharge), CDE (cable discharge events), and lightning. It is built to withstand temperatures from -10 to 70°C and Humidity: 10 to 95% (non-condensing). For our functional testing, we powered the CL1101 locally using an external AC power adapter. The Ethernet port of the CL1101 local RJ-45 was connected to an Ethernet network port on a wireless Ethernet Bridge [essentially, we are extending a wired Ethernet connection from a wireless Ethernet bridge]. A point to point connection setup was completed i.e. the CL1101 local and CL1101 remote units work as a pair. Essentially, you would interconnect the RJ-45 line ports of the units together. At the far end, the Ethernet RJ-45 port was connected to an IP TV and we were able to transparently stream video traffic. For verification of 802.3af we connected it to a PoE IP phone.We used the 4-position DIP switch on the units to set the line rate: 10 Mbps or 100 Mbps, number of wire pairs (2-wire/single pair, 4-wire/2 pairs, 8-wire/4 pairs); the PoE mode: 802.3af. LED’s on the local and remote units provided us visual indicators for line/power. IP67 NEMA4X PoE Ethernet extenders should be dust proof and watertight, as to be ideal for outdoor and indoor environments like warehouses, factories and other industrial settings. However it is important to follow vendor guidelines to maintain IP67 performance. It is also essential to consult the vendor’s data reach and power delivery estimates based on the cabling type/gauge that will be used for the line interconnection. You can read full online article in the Patton Articles Archive. . .
What applications would you target?